How Can I Go Metro Discount Airport Parking? 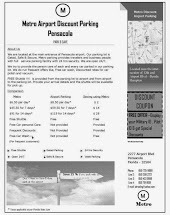 Where is Metro Discount Airport Parking in Pensacola on the Map? I have only used it once and they were so nice. They come to pick you up quickly after you arrive. They offer cold or room temperature water. Very nice staff. I plan to use them every time we fly. I have used Metro Discount Parking for years. THIS IS THE PLACE TO GO. They are friendly, super fast, provide excellent service, and take care of your stuff. I trust them with our luxury vehicles and use them EVERY time I fly out of Pensacola! I was pulling into PNS airport last minute for a weekend trip when I saw this place on the corner, literally less than a quarter mile from the parking garage of the on site parking garage. I pulled in, handed off my car, and was immediately shuttled feet up the road to departures. There was no wait, they were very friendly and helpful. The claim ticket has the phone number on it so when I returned a few days later I called for pick up as my bag came off the baggage claim and by the time I got outside to the pick up area, the shuttle was already pulling up. They loaded my bags and my vehicle was ready for me once we returned. I would use this service again and again. Super convenient and affordable! This place is INCREDIBLE. Amazing service, employees are so nice, respectful, and professional. They take great care of your vehicle and the service is so fast, easy, and painless. They literally pick you up 90 seconds after you call it's amazing. Plus they are the best deal around- the value is incredible. I look forward to parking with them every time I go out of town.